Getting ready for the big game tonight (Go Pack Go) I decided I wanted to be presentable when meeting up with my football crew for pizza and adult beverages so I knew it was time for a mini spa day at the apartment. Time for Sabon’s salt scrubs, a mini facial and manicure! You have to look good for the new football season! After finishing my Vanilla Coconut Salt Scrub from Sabon, I was ready to try a new scent from Sabon’s Salt Scrub collection and grabbed the Kiwi Mango Scrub from my bath stash. I was a little confused at first when I realized that my scrub was called Sweet Summer but after some research on the website, I realized it had gone under a name change in recent months. Same product, different name. The Application: The best way to use Sabon’s salt scrubs is to use their little scooper that you can buy for around a $1.00. Be careful though as the scrub is housed in a glass jar and the shower water mixed with the scrub oils makes for a lethal combination if dropped. Okay, maybe not lethal, but still, broken glass is never your friend unless you like crazy broken glass sculpting. Also, it’s best to wet yourself first, turn off the shower, and then scrub to your little heart’s content. This makes it easier to scrub your skin as the shower water isn’t washing away the scrub before you get a chance to make it work for you. The Scent: I have loved all the fragrances I have tried before from Sabon’s salt scrub collection, but this one was not my favorite as the Kiwi Mango combination didn’t really work for me. The color of the scrub itself isn’t the most attractive as it’s sort of a murky, grayish, green color which isn’t visually appealing. I love, love, love Sabon, but the Kiwi Mango scrub reminded me of week old fruit salad. You know how when you leave fruit salad sitting too long the scent and taste becomes so watery that it kills off the pure taste and fragrance of the fruit? Well, this was the equivalent. It didn’t smell fresh at all and I was unable to identify either the kiwi or the mango. I won’t lie, I was disappointed with this scrub scent. The Verdict: My love for Sabon does not change. Sabon scrubbing salts are fantastic and I can’t live without them, but this one missed the mark due to the fragrance. It just didn’t live up to the other fragrances I’ve tried, but different people like different things so maybe this fragrance just didn’t work for me. 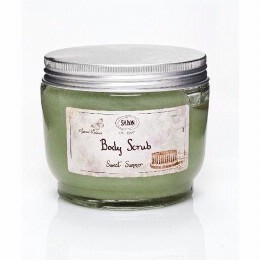 I love Sabon and will keep using their scrub, I will just pass on the Kiwi Mango in the future. I know, I know! Finally more than just nail polish! But yes, I really do have a polish obsession and I may need help, but I’m back to other items too so watch out! Besides my love for polish, I love Sabon’s soaps and have a huge stash thanks to a fantastic sale earlier in the summer. 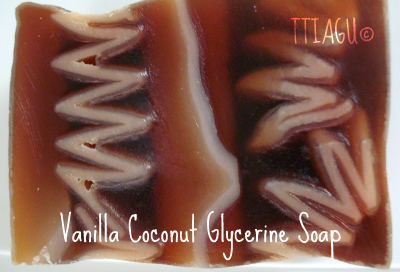 So here is a review Sabon’s Vanilla Coconut Glycerine Soap. The Application: Sabon Vanilla Coconut Glycerine Soap lathers really well which was nice as I like a nice lather. 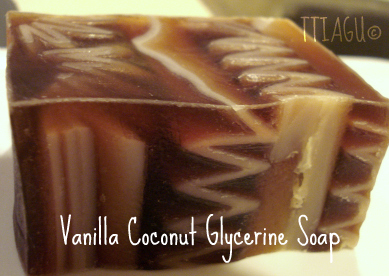 It’s interesting to note that the Vanilla Coconut Glycerine Soap on the website looks different from the one that was I received. The one I have has a lot of different designs and grooves which is not a bad thing. In fact, it is quite unique and thrilling. As the softer soap wears away, you are left with the grooves which makes for some great cleaning power. The Verdict: Fun tip! Cut the soap into smaller sections as Sabon’s soaps are gentler and don’t last as long as the drugstore ones. If you break up the bar, it will last you twice as long and will give you more bang for your buck! Now would I buyVanilla Coconut Glycerine Soap again? You know I love you Sabon, but no. This scent just doesn’t work for me though I love the lather and the size of the bar was more generous than the other scents I received. Still, Sabon has many other great scents so don’t be afraid to give them a try! When Sabon had a huge sale earlier this summer, I finally picked up the Face Polisher that a friend of mine had been talking about for the past six months. Look, Sabon can be expensive, so I tend to buy only when there is a sale. Now that I have been using it for the past six weeks, I feel like I have had enough time to review it fairly. The Fragrance: Sabon Face Polisher is a cream based glycerin wash with small scrubbing beads. The scent is a mix of both mint and lemongrass, though to me, the mint is more apparent. 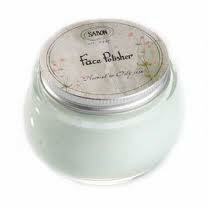 The Application: Sabon Face Polisher comes in a glass jar like most of Sabon’s products. For the Salt Scrub you’re suppose to use a little scooper to get the product out, with the Face Polisher, you’re supposed to use your fingers. There is nothing wrong with that I guess as you should be clean after washing off in the shower, but I am not a big fan of dipping into products with my fingers and then applying it, but it really is a small thing to complain about as my hands are clean once I dip into the product. Still, I know some people who really hate the double dip. The best way to use the Face Polisher is to wet your face well and then apply about a teaspoon worth of the polisher to your face messaging it gently into your skin. The scrub has rounded beads which are better for your skin than sharp beads such as pits like in some products, but you still want to be gentle. The Sabon Face Polisher should be used no more than twice a week since it’s an exfoliator. The Verdict: I find Sabon Face Polisher to be a great exfoliator! It really is quite refreshing and makes the skin tingle in a good way after using the scrub thanks to the mint. I can definitely tell that my skin is both cleaner and smoother after using it. After six weeks, I don’t know if I see a difference in my skin, but I am a big fan of exfoliating so my old product may have been working just as well. But I can say that it’s not making my face break out due to the ingredients and it does not irritate my skin and let me tell you, my skin can be sensitive at times. I won’t lie, the price is a little bit steep at $29.00 a pop, but it does last a while though I’m sure there are cheaper alternatives out there, just make sure the exfoliating beads are round so you don’t scratch up your face. You may not see the scratches as they will be small, but it can do a number on your face in the long run. 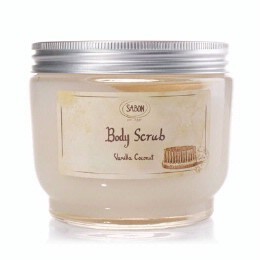 Also, at this time Sabon is only in a few select cities in the US and Europe but you can always order online. I live in NYC, so there are about five stores around the city at this time making it accessible. Finally I have been able to move onto another scent of Sabon’s handmade soap. For a while there, my shower was looking like a soap shop with tons of samples but now everything is under control. So I dug into my drawer and picked out Sabon’s Honey Peach Glycerin Soap. The Description: The first thing that struck me about this soap was how much it reminded me of a Jell-o dessert I used to get as a kid. It seriously looked so good I almost checked my freezer for Cool Whip but changed my mind when I had flashbacks to all of the soap I had to eat due to my potty mouth as a kid. The second thing I noticed was that this soap had a very light sweet peach scent the sweet scent being the hint of honey put into the bar. Very nice touch! The Application: I really enjoyed the soap thanks to its fabulous scent, but the lathering properties were a wee bit weak. It does lather eventually but it takes some time and dedication, something I don’t really want from a soap. Also, the scent is pretty light and doesn’t really stay with you after the final rinse. 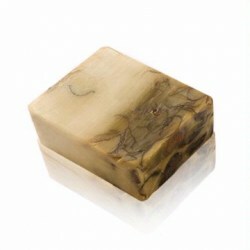 The honey peach soap is very moisturizing which is always a good thing! The Verdict: The lack of lathering was a bit of a disappointment, but I think I would buy this one again. The scent is freshly, fabulous and my childhood memory of the Jell-O totally makes it worth it. I love Sabon, I love it so much. Unfortunately, it does tend to be a little on the spendy side but in the end, for me, this bath scrub is so worth it! I love that just stepped out of the spa feeling I get every time I use this scrub. The Vanilla Coconut Bath Scrub scent is fabulous but remember this is coming from a vanilla addict. Sabon is not available in most cities in the US, only a select few, but you can order their products from their website. I live in NYC so I get to be spoiled by Sabon daily. The best way for anyone to buy Sabon products is to wait for their sales that include free shipping as they don’t tend to have many sales in their actual stores that often. The Application: A little bit of a tip. It’s best to wet your skin first then apply the sea salt without the shower running. This way you will not wash off the salt before you actually have the chance to scrub. After you have gotten a good scrub, then turn on the shower and wash it off. Caution, it may make your shower slippery so be careful, the bathtub is too small to be a Slip and Slide. Also, the first time I used this salt scrub I went ape on it and ended up scratching myself. Yeah, not smart when using a “salt” product. Salt and wounds don’t mix! So remember be gentle to your skin, folks. Lesson learned. The Verdict: Okay, who am I kidding. I LOVE this stuff and will pay the $30.00 for a large size. They usually last me 2-3 months anyway which is not too crazy for the price. Here’s the thing, Sabon says to use this only once a week, but I am a daredevil and do it twice. But if you use it once a week, it will last you 3-4 months. As far as the actual product, the Vanilla Coconut Bath Scrub smells amazing while the moisturizing properties are fantastic. This is perfect for year round usage, but during the winter this puppy is especially great as it will scrub away all your rough spot cares leaving you with beautiful, radiant skin. I have finally been able to try a few new Sabon soaps that I have been dying to try after buying a bunch of them after a great sale. Most soaps tend to be a little too drying for my liking. Let me put it this way, if after washing with soap your skin feels squeaky clean, then it has leached out all the essential natural oils in your skin. You do not want to do this…trust me. I used to think it was okay when I was a teenager and had no qualms about washing with Irish Spring or other value brands, but I have evolved. soap is used, it becomes more pronounced which at first threw me off as it looked like an emerging coral reef which was unexpected. Just for fun, I added a top view to allow you to see the magic of the coral fun. Looking at it, it sort of looks like some exotic taffy or some nougat bar with caramel and peanuts. That in itself makes it worth trying but I don’t advise eating it. Just know that these bits are what you will be left with after the soap is used more and more. I still don’t know exactly what to think about it as it is a unique feature, but in the end, it makes for a great exfoliator whether it is supposed to be or not. After finally trying Kiwi Mango Rose Petals Glycerin Soap from Sabon, I have to say I am rather pleased. I can’t wait to start cracking into the new scents and probably will soon thanks to my amazing ability to get bored easily. Damn video games! Sabon is one of the best soap stores you will encounter, ever! This is one of the many times I am so happy to live in NYC because it is one of the only cities in the US besides Boston and Chicago where you can by Sabon products. It is known internationally so if you find your self in Belgium, Canada, Israel (headquarters), Italy, Japan or The Netherlands you can stop on by, but in the end it may just be better to just buy it online because it is so worth it! First let me start with the handmade soap. I won’t lie, it is a little more expensive than what you would buy at the drugstore, but this ain’t Irish Spring folks! The soap will set you back around $6.80 a bar but it is well worth the price. 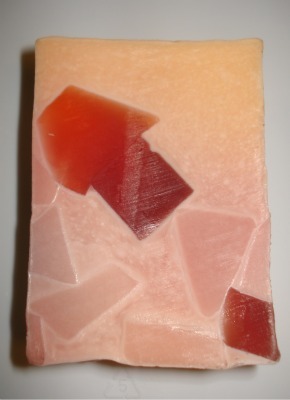 The soaps are very gentle as they are made of glycerin or olive oil which are great for the skin. Also, there are many different scents to choose from though if you fall in love with one, they may not have it when you come back as they only get what the main headquarters sends them. Sabon had two types of soap for the face. The first one is the Honey Vanilla Wheat Soap which is made with olive oil while the other is the Vanilla Wheat Soap which made from Glycerin. Of the two face soaps, I tried Honey Vanilla Wheat Soap first and have to say it really worked very well with my skin type. Because I have oily skin, I thought the olive oil would be too greasy for me, but have since found that oil is great for those with oily skin because oil dissolves oil. Out of the two, I had been told that this soap was more likely to dry out the skin and bring forth eruptions from beneath the skin in an attempt to clean out the pores. I experience neither of these reactions, in fact, my skin felt very clean and not dry at all. Also, after a week, I didn’t notice any breakouts what so ever. Maybe my skin is just that clear…or not. As for the Vanilla Wheat Soap, this one is great for moisturizing the skin. For me, it may have been too moisturizing. Again, due to my oily complexion, I don’t really need moisture, but it was recommend that I try this one as it is the more popular of the two. I most likely wouldn’t buy this one again because even in the dead of winter, my face just doesn’t need this type conditioning but it would be great for those with drier skin. Both soaps smell nice enough though these two soaps aren’t about the smell as much as they are for treating the skin which they do well. One thing, whatever you do, do not get this stuff in your eyes! I did the first time I used it and I was flushing my eyes out within the first 10 seconds between tears. It burned, but my retinas have never been cleaner. Luckily I retained my eyesight so bonus! In the future as I use more body soaps from Sabon, I will post my opinion on them. There was an amazing sale online and I bought several, but thanks to my soap cutting trick, they are lasting a lot longer. So if you find yourself in NYC, just follow your nose to Sabon, you can’t miss it as the fragrance permeates everything within a two block radius. Trust me, that is a glorious thing, especially in NYC.